Worn out tynes not grooming and scarifying the court as they should? Don’t worry, they are easily replaced! With new tynes, your court will get the attention it deserves, and you (and your guests) will notice a difference. 10-S Tennis Supply offers a selection of Court Rake tynes (Court Rake pictured above) as well as replacements for all Gator Rake models, and we would be happy to discuss which option is right for you and your facility! Don’t let this happen to you – shoot us a text, send us an email, or give us a call and we’d be happy to help! If you find yourself in the unenviable position of having a broken net cable, it is not always necessary to purchase a new net! If your net has seen better days, it might be worth the investment in a new one. But, if you feel your net still has life left in it, you have the option of replacing the cable rather than the whole net. Lay out the new cable as straight and flat as possible. Tape the new cable to end of the old cable as securely as possible – you may need to pinch the end of the cable as small as possible under the tape to ensure it goes through the headband easily. If you are working alone, you may need to secure one end of the net to the post with twine to gain leverage. Pull the cable through the net until the taped portion is safely out on the other side. Dispose of the old cable and tape and enjoy your functioning net! If you would like a visual representation of these steps, please watch this video below for the full tutorial! If you have any further questions about broken net cables, new nets, or any other product knowledge, please contact 10-S Tennis Supply at 800-247-3907, or visit 10-s.com! You can also text in your questions or orders to our new text line, 954-800-6790 and someone will be happy to assist you! Shipping Specials at 10-S Tennis Supply! Information about Tuffy windscreens, or any other products, can be found at 10-s.com, or by giving a call at 800-247-3907 to the friendly and capable staff at 10-S Tennis Supply! From time to time, we here at 10-S Tennis Supply would like to present (or remind our customers about) a product or maintenance tool that we feel is really top-notch! This week’s edition focuses on a new product in our line – the 10-S Teaching Cart Caddy! Why do I need this caddy? The 10-S Teaching Cart Caddy is designed to make your life a little easier. You don’t have to worry about where to put your phone, keys, water bottle, clipboard, or tablet when you are out on the court! This handy product keeps all of your effects organized in one place for easy retrieval. It quickly attaches to the back of almost any teaching basket, making it a convenient organizational tool for any court or facility! You can find this caddy, as well as a full range of teaching carts, on our website, 10-S.com, or call and speak to a Customer Service Representative at 800-247-3907! We know you want your facility to look its best for all of your tournaments and events. Here is a reminder of a few items you may want to consider investing in (or replacing) in time for the big event. The most obvious of choices in preparing for visitors and players at your facility is the windscreen on your fences. A must-have at all big clubs – windscreen helps with the overall aesthetics of your facility while also maintaining the functionality of your courts by blocking out wind and providing a backdrop with which to better see the tennis ball while in play. Add in your club or facility logo and you are sure to impress your guests! However, faded or tattered windscreen pieces will impress no one, so it is wise to check over your screens ahead of time to make sure they are still looking their best. Please remember that custom windscreens – especially with logos – are not something you can get last minute. Be sure to plan ahead to avoid frustration! Net logos are a perfect way to present your club or sponsor logo. A set of 4 windscreen panels made to fit perfectly on your tennis net, showcasing any name or logo you would like to display. Best yet, they are attached with windscreen tys – so if you do not need these logos to be a permanent fixture at your facility, they can be easily removed and stored until you need them again! As you have most likely experienced, (especially our friends in South Florida) overly-wet courts when you have one or more matches scheduled can be a panic-inducing problem. Having some court water removers on hand might help you to get your courts back to playing condition with the shortest possible delay. There are water-removal options for both hard and clay courts – making these a good staple to have at any facility. If you already have these units but need fresh replacement rollers or sponges, 10-S Tennis Supply can help you out! Your court accessories can also make a strong impression on guests or players at your facility! Are your nets in good shape? Do you have plenty of benches for seating and a Court Caddy on every court so that players or guests have a place for their personal items and trash? Do you have the proper scorekeepers on each court for your upcoming matches? Replacing court accessories when they are worn out or broken will go a long way to ensuring a successful tournament or event. This might entail purchasing new units or replacement parts. But, these small details can make a big difference – particularly if you will be photographing the event. For all of these products and more, please visit 10-S.com, or call 800-247-3907 to speak with a Customer Service Representative from 10-S Tennis Supply! As the 2017 Hurricane season moves in to full swing, take a moment to familiarize yourself with the best ways to storm-proof your sport courts. For all properties, your sport courts or sporting facilities are an asset you want to protect. The better you pre-plan when a bad storm is looming, the more likely you are to decrease the damage sustained and therefore minimize any expense incurred to get your facility back up to par. Many of the tips shown here are very cost effective to enforce – it’s just a matter of taking the time to protect your investment before it’s too late. As we’ve seen in year’s past, both tropical storms and hurricanes can pose a real threat in the southeastern coastal states especially, Florida, Georgia, South Carolina, North Carolina, Alabama, Mississippi, Louisiana and Texas. Those threats include damage to all types of sport courts (tennis, bocce, shuffleboard, Pickleball, basketball, volleyball, etc. ), their surrounding fencing, amenities and lighting. It is recommended that you take the following steps to prepare for an impending storm. Many of the most important storm preparedness tips surround the area of securing windscreens around your facility. During heavy winds, windscreens can act almost as a sailboat sail, catching strong wind gusts and potentially damaging your fencing. It is not uncommon for a windscreen to pull over a fence completely when bad winds are blowing through your area. 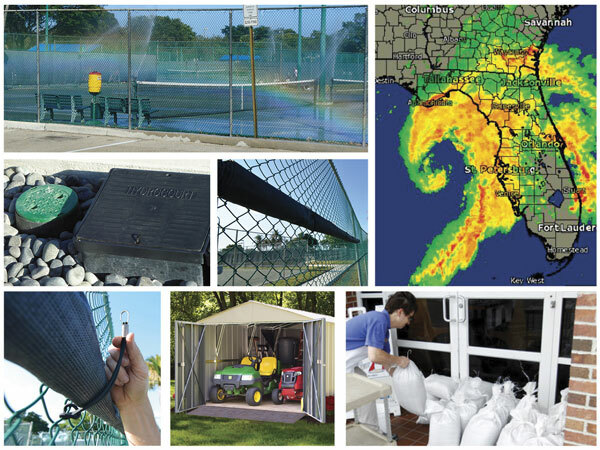 This is why this portion of storm preparation is often one of the most important for safeguarding your facility. If your facility has windscreen be sure to order plenty of extra windscreen ty-raps, fastening rope and snaps before the storm season approaches. As the storm makes it way towards your facility, remove, label and store your windscreen. Cut the ty-raps along the bottom and sides of the windscreen. Roll your windscreen to the top of the fence. Fasten and secure with rope. Cut the ty-raps along the top and bottom of the windscreen. Roll your windscreen to the middle of the fence. Remove all tennis and/or Pickleball nets. Remove all unsecured court benches, tables and chairs from cabanas or viewing areas and secure in a safe area. Remove all court equipment from fences (liner brooms, squeegees, etc.). Roll the courts the day before the storm is expected to compact the Har-Tru as much as possible. This will reduce the amount of material that is lost during the storm. If high winds are expected, water the court before the storm to reduce the amount of material lost due to the wind. If the irrigation system is on a timer, be sure to manually shut off the system so that it does not turn on during the storm. Remember to turn the timer back on after the storm has passed. Shut off water to the control boxes +/- 12 hours before the storm and open the drain pipe on the control boxes. This will allow the system to fully drain and prepare the FDC HydroCourt to receive the torrential rains experienced with most hurricanes. Remember to turn the water back on and close the drain pipe after the storm has passed – specifically after there is no longer any standing water on the court. Please remember, 10-S Tennis Supply offers a full line of windscreen accessories to help get you through the hurricane season. Visit us online at www.10-S.com for all of your sport court needs. Fast-Dry Courts, Inc. is also available to help you get your sport facilities in top notch shape – regardless of the weather. Visit us online to see more ways we can assist with making your facility even more desirable to new residents – www.Fast-Dry.com. Is Your Ball Mower Acting Up? 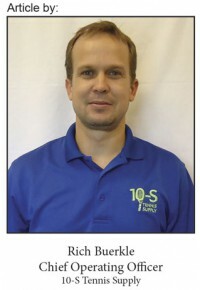 If your ball mower is not working properly, we at 10-S Tennis Supply can help! No one wants operating a piece of court equipment to be more frustrating than useful (as seen in the video above) – so it might be time to replace the whole unit, or at least some of the parts! What’s New in the 10-S Warehouse? The boys at 10-S Tennis Supply are hard at work making sure over 1,000 items are in stock and ready to ship out daily! New Pickleball Products Available from 10-S Tennis Supply!